Science Fiction is a varied genre that has been around for longer than you might imagine. Its origin is a subject for debate with camps claiming that it started as early as 2150 BCE or between the 17th and 19th centuries. Some scholars claim science fiction formed in the ancient Mesopotamian epic of Gilgamesh. Ancient Indian poetry such as the Hindu epic Ramayana has science fiction elements as does the works of the ancient Greek playwright, Aristophanes. Regardless of where and when science fiction began, we are just glad it did. 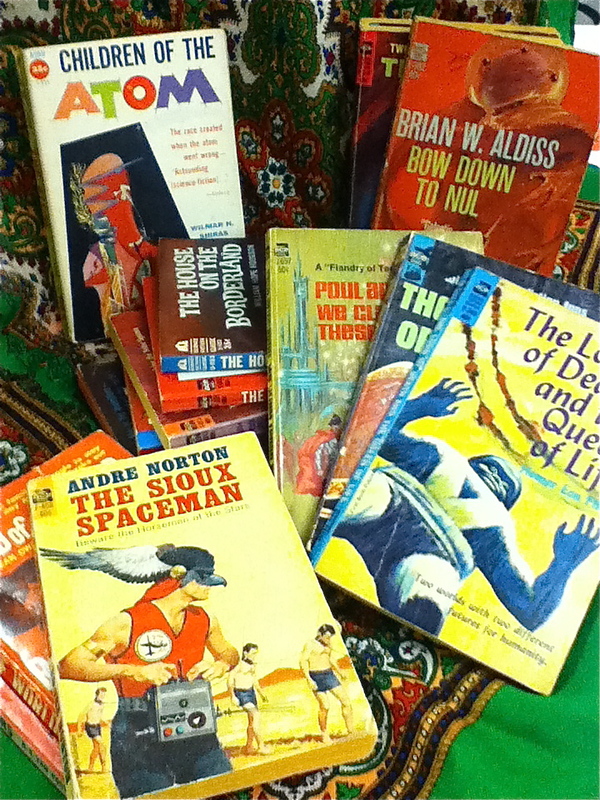 Science fiction began to be widely popularized in the 1960s and 1970s with pulp publishers like Ace Books and Avon Publications. These houses reprinted titles and combined them with futuristic cover art for a new look and a larger audience. Not all of those stories were new. Bold and imaginative titles were written in the early 1900s. For example, The Lord of Death and the Queen of Life by Homer Eon Flint was written in 1919. Who can resist that title? And the author’s name is stellar! In Flint’s tale, four pioneers travel to Mercury and Venus where they are then given a riddle, the answer to which will determine the fate of all humanity. Children of the Atom by Wilmar H. Shiras was first released in 1948. This tale follows mutant creatures born in the wake of an atomic explosion. They look just like us but have special powers. A more modern take on the space age can be found in Ray Cummings’ Beyond the Stars. Cummings poses the question, “Is the entire universe just one of the atoms of some even greater cosmos?” It wouldn’t be science fiction without titles like Thinking Machines by Groff Conklin, End of the World by Dean Owen and The Second Atlantis by Robert Moore Williams. The enjoyment readers get from these vintage works is endless and the cover art is imaginative. Modern science fiction readers would do well to read these classic titles. Following what current day writers have done with the genre is fascinating and we can’t fully appreciate their work until we experience what came before. If you are already a fan of classic science fiction, check out our upcycled blank notebooks on Shopify. Pulp books weren’t made to last forever and we find that unfortunate considering all the thought that went into creating them. We’ve taken these old books that can’t be enjoyed any longer due to lost pages and extensive damage and given them new life. We use archival materials so that you can use them as journals or scrapbooks to keep your memories vibrant for many years to come. To sweeten the pot, we don’t charge shipping on this item. * Bookmans is the place to browse for new to you books, but you will do well to call ahead for specific titles. Bookmans does not guarantee stock.